I used Cheep Talk and one of their newest stamps Gingham BG! I am playing their current Sketch Challenge, I flipped the sketch and this is the result. Hello my friends! Hope you are having a great Wednesday. Today I have a Clean and Simple card using Heartfelt Creations Stamps. 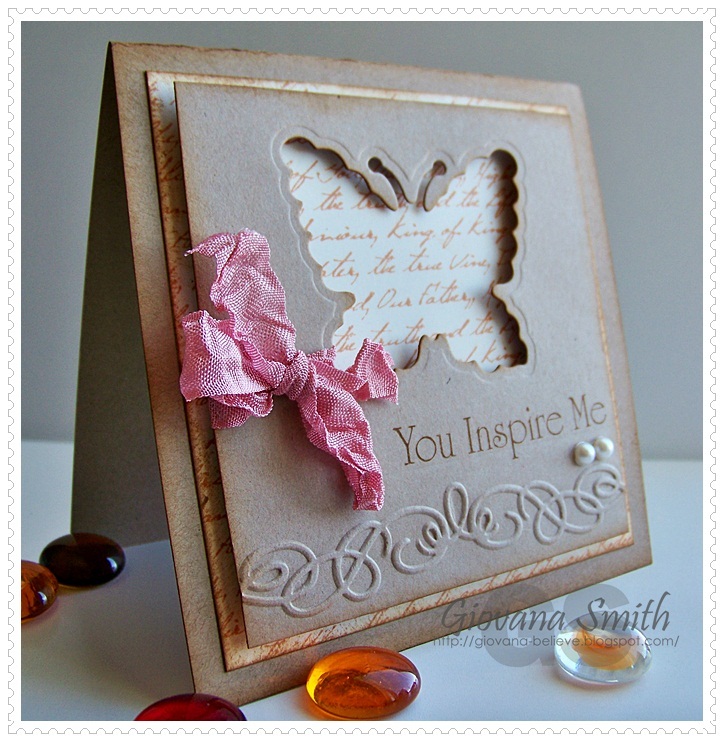 HCPC 3363 Inspire Me Sentiments Pre-Cut Set. HCPC 3367 Vintage Life Background Set. HCD 702 Decorative Butterfly- Border Die. Accessories: Organic Flourish Embossing folder (Provo-craft), Pearls, Seam Binding Ribbon (etsy), Foam tape, Scor-tape. Make card base from Kraft cardstock. 4.25" square. Stamp Background on Ivory Cardstock in Tea Dye Ink. Adhere it to card. Cut a panel from Kraft Cardstock. 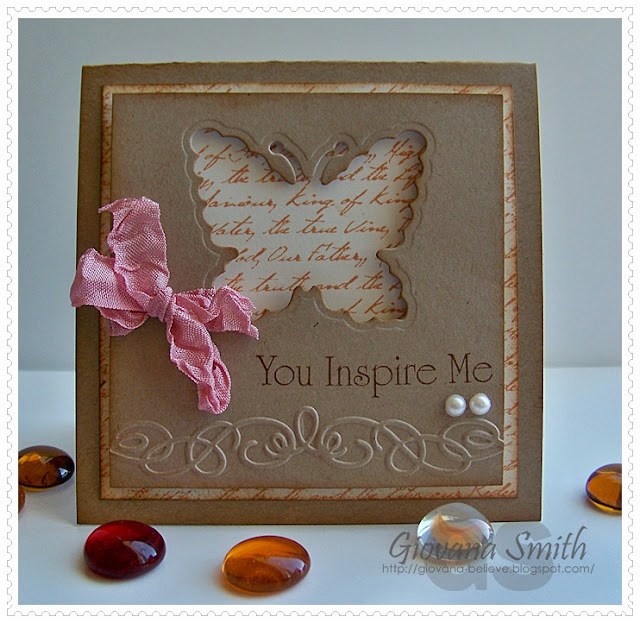 Die-cut and emboss Butterfly, keeping the negative. Stamp sentiment, emboss bottom part of panel and tie on ribbon. Adhere panel to card base with foam tape. For more inspiration and projects, please visit the Heartfelt Creations Blog. Hello my friends! Hope you are having a great day. Sorry for the lack of post lately. I don't want to bother you with my stuff, but I am having really and ugly back problems, not much stamping time for me and in addition of that 2 weeks ago I feel down and my poor back is worse. Please if you pray, keep me in your prayers. 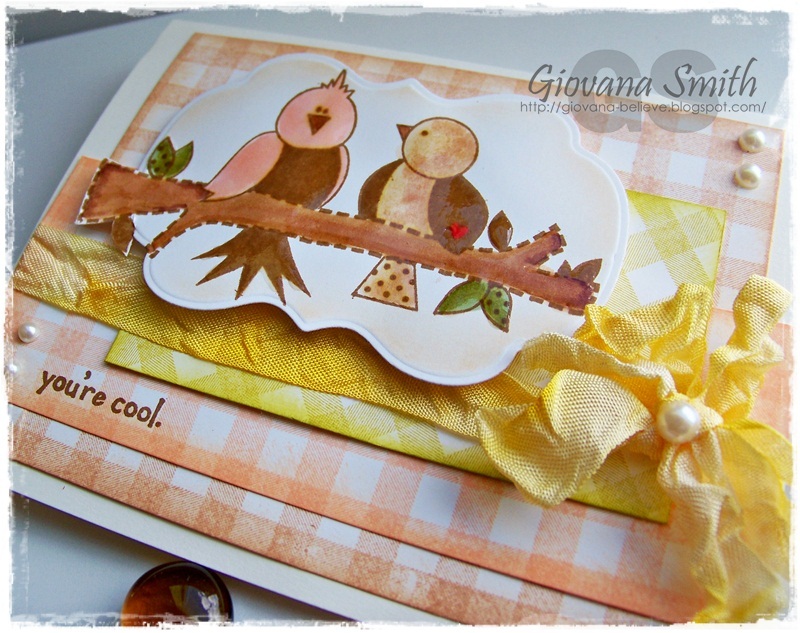 Anyway, today after doing a quick trip for the blogosphere and I found one of the cute challenges over at Moxi Fab World: The Vertical Sketch Challenge and since I had this card already made, I just decided to write a quick post and show you this pretty card. 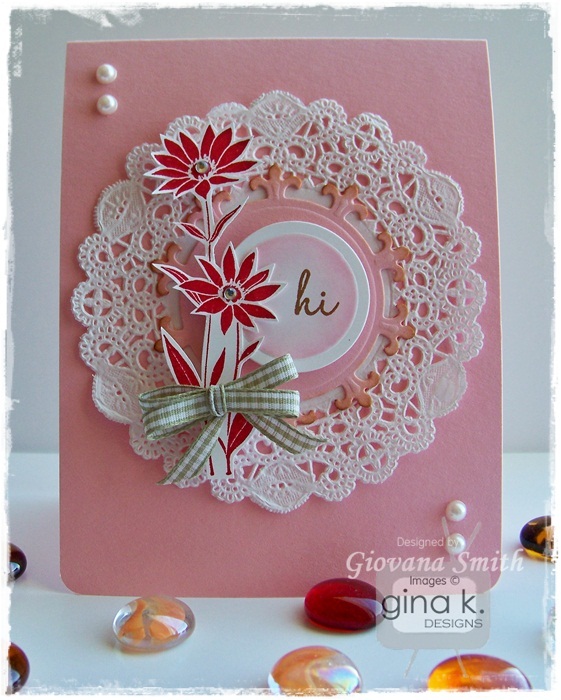 As you can see this card is very simple and super fabulous!! Sentiment buttons and Cardstocks are from Gina K. Designs, the paper is from Cosmo Cricket: Material Girl Collection. 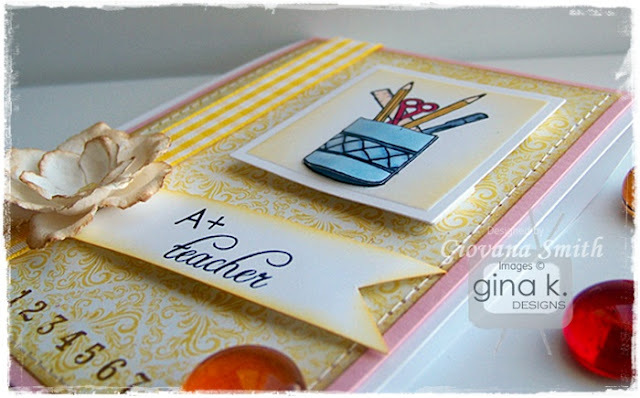 Our challenge this week is all about "Back to School Projects" and it is sponsored by "Your Next Stamp"!!! Make card from Blue cardstock. 5" square. Cut a panel from White cardstock (4.75" square). Cut a panel from Ocean Mist Cardstock (4.5" square), ink all edges, emboss it and add stitches. Mat this with White panel. 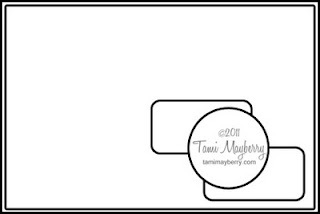 Stamp image onto White Cardstock, color it with Copic Markers. Die-cut, emboss and stencil image with Square Nestabilities. Adhere it to card. Stamp sentiment. Adhere it to card with foam tape. Ink: Memento Tuxedo Black (Tsukineko), Faded Jeans Distress (Ranger Industries). Embellishments: Blue eyelets, Jute twine. Accessories: Embossing folder, Square nestabilities (Spellbinders), Copic Markers, Sewing machine, Pop dots. Scor-tape. HCPC 3374 Flora Grande 2 Pre-Cut Set. HCPC 3375 Flora Grande 1 Pre-Cut Set. HCPC 3363 Inspire Me Sentimets Pre-Cut Set. 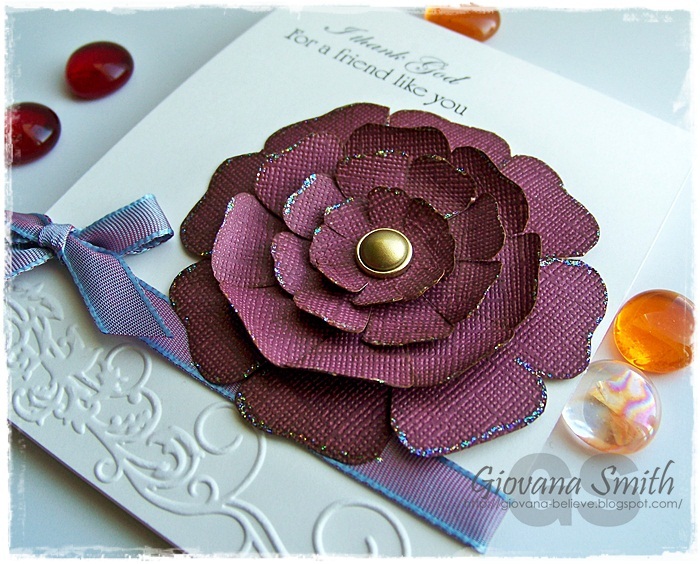 Cardstock: Ivory (GKD), Burgundy Texture. Stamp sentiment on left top side in Black ink. Stamp flowers on Burgundy Cardstock in Walnut Stain Ink. 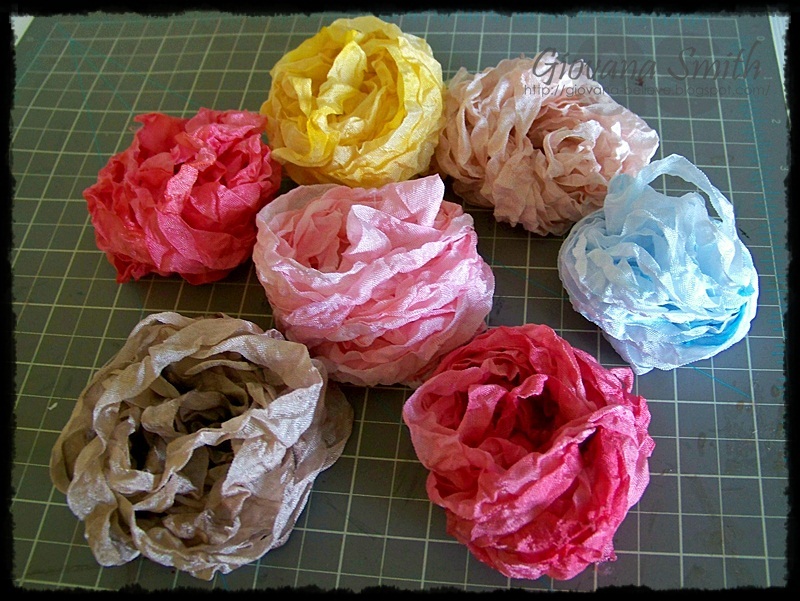 Cut them out, curl petals and create a big flower. Add Stickles to all edges. Add a Gold Grad and adhere it to card. Hello my friends! Hope you are having a great day!! Today I have a "Clean & Simple" card for you, using Fabric Tape from Love my Tapes. Die-cut a square panel. Cover panel with Mini Check Peppermint Fabric Tape. Add some Twine around, foam tape and adhere panel to card. Stamp image, die-cut, emboss and stencil it. Adhere it to card. Stamp sentiment and add Red Rhinestones. Accessories: Circle Nestabilities, Square Nestabilities (Spellbinders), Foam tape, Sponges. Hope you like it and give this a try! 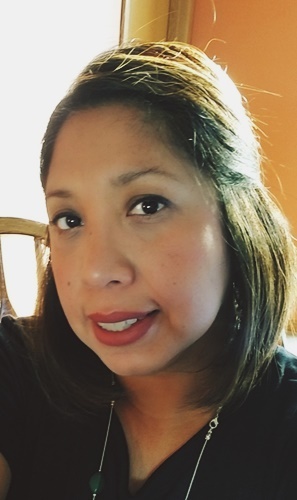 Vera, please contact me at giovanachavez AT msn DOT com with your info so I can send your ribbon right away!! Hello my friends! Are you starting a great week? I hope mine is good. Last Saturday I had a little accident, I fell down outside while watering my yard. I stepped on wet soil and I went down the hill like skiing, my back got all the impact and I've been in so much pain, hopefully I am feeling better today, my back still sore, but I can walk better. 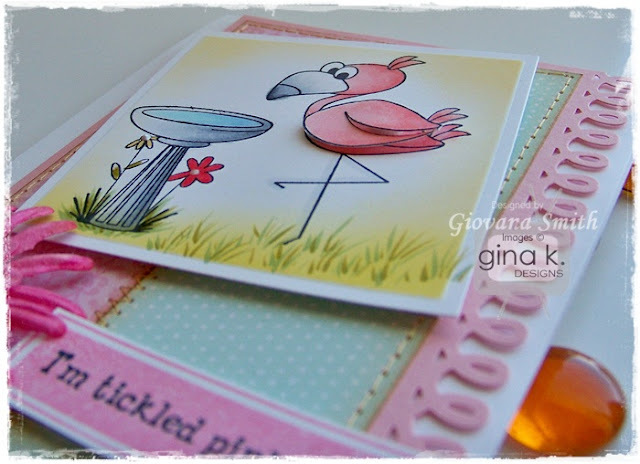 Anyways, today I am hosting a challenge over at StampTV and I hope you can play along too! The challenge is all about school, anything school related. 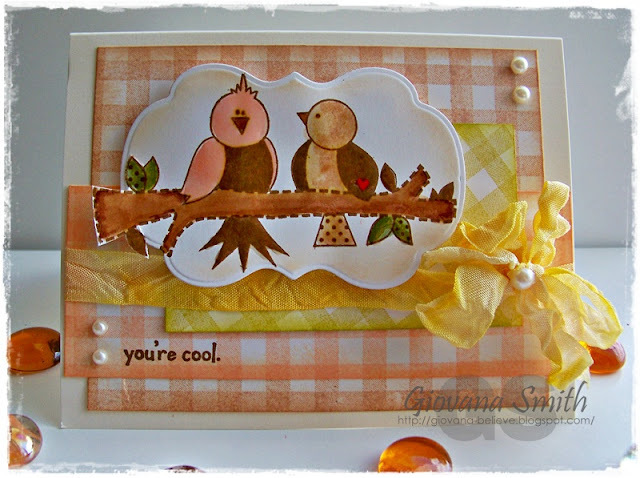 This is the card I made for Mix it Up Monday Challenge. 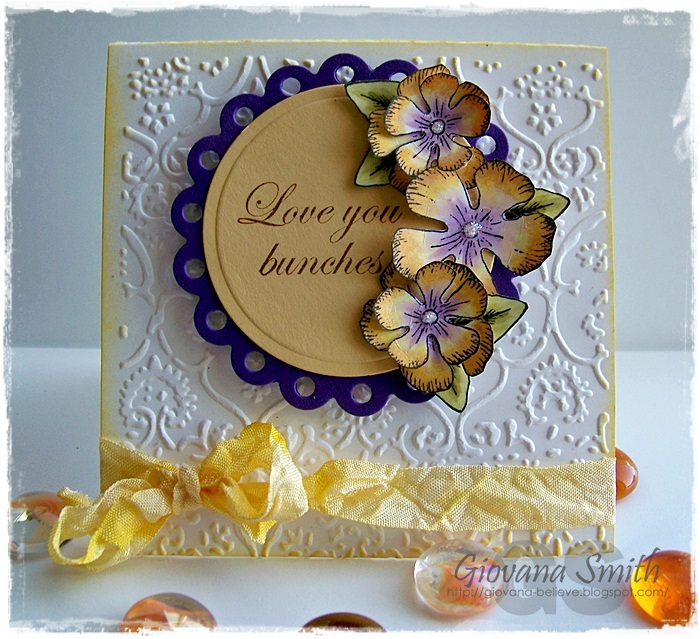 The sentiment and image are from Falling For you StampTV Kit and the numbers are from Perfect Pennants. WOW now this is a challenge. all the colors are awesome I am drawn toward the pink in the middle. Please, send me your info at giovanachavez AT msn DOT com. PS: I haven't heard from Pam yet, I will give her until Monday to contact me, if not I will randomly pick another winner. Thanks!! A new winner has been chosen. 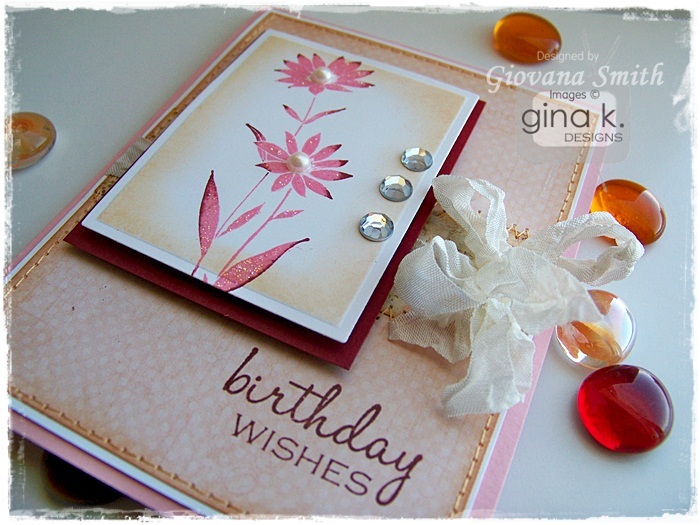 Hello my friends and welcome to another Gina K. Design Team Blog Hop! This time we are doing a Double Take!! 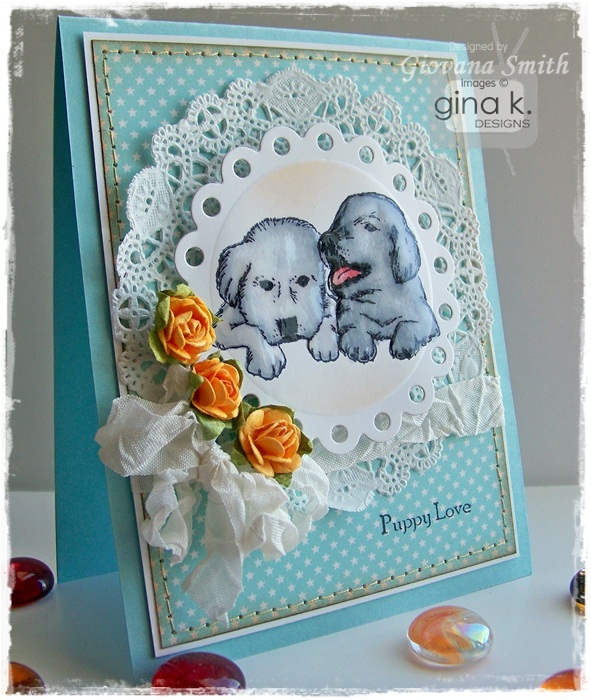 Members of Gina K.'s Design Team have come together to host a hop where we will show you how to make cards using the same products and stamp images to create two very different cards. Same products I used for my cards: Ivory Cardstock, the fence is from Heartfelt Set and the pumpkins and sentiment are from the new StampTV kit: Falling for You, the patterned paper is Falling for you (StampTV Kit), Crystal Lacquer, sewing stitches, seam binding ribbon, Copic Markers. The embossing folder is not the same in both cards, BUT they come from the same package of embossing folder borders :) also a little difference is that I used Fleur de Lis Dies on my square card. 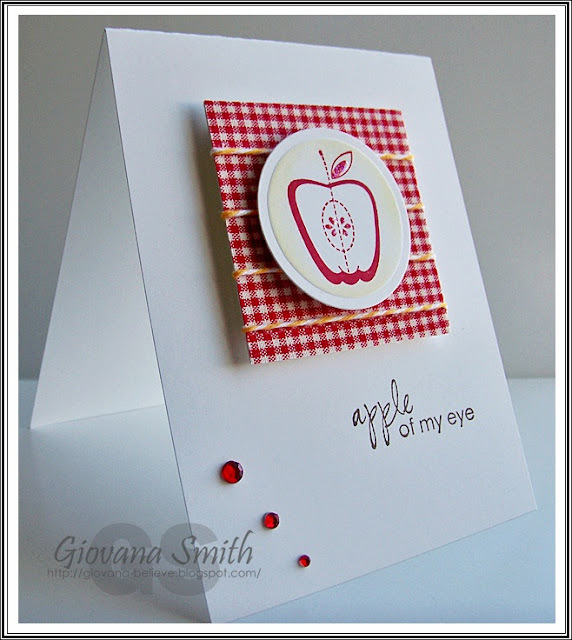 Regular A2 size card: 4.25" x 5.5"
Square card: 4.5" x 4.5"
Head on over to Donna's Blog to see what she's sharing with you today! Hello my friends! Hope you are having a great Wednesday. Today I have a couple of projects using Heartfelt Creations Stamps and dies. HCPC 3407 Botanical Floral 2 Pre-Cut Set. Accessories: Textile embossing folder (Provo craft), Yellow Seam Binding (Handmade), Star Dust Stickles (Ranger Industries), Foam tape. 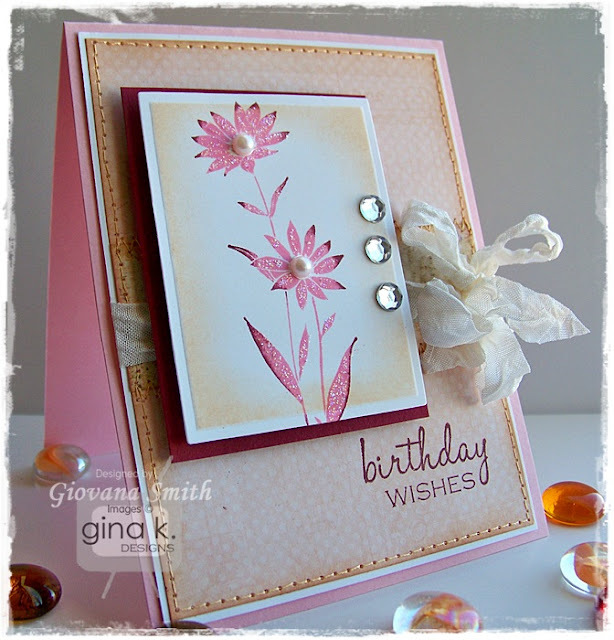 Make card base from White Cardstock. 4.25" square card. Emboss front of card and ink all edges. Stamp flowers and leaves from HCPC 3407 Botanical Floral 2 Pre-Cut Set on White Cardstock in Black Ink. Color them with Copic Markers: Leaves: YG95, YG97, Y11; Flowers: V01, V12, V15, Y11, Y13, Y15, Y17. Cut out all flowers and leaves. Die-cut a Circle and Eyelet Circle Panel from cardstock. Mat them together. Stamp sentiment on Sweet Corn panel. Arrange flowers and glue themonto panel. Add panel and flowers to card. Add Star Dust Stickles on flowers. HCPC 3411 Woven Basket Pre-Cut Set. HCPC 3410 Decorative Basket Pre-Cut Set. Accessories: White Opal Liquid Pearls (Ranger), Star Dust Stickles (Ranger), Seam Binding Ribbon (etsy), Copic Markers. Stamp Woven Bakets on Ivory cardstock i Vintage Photo Distress Ink. Color them with Copic Markers: E31, E33, E35, E37. Die-cut them using Basket Dies. Stamp flowers on White Cardtsock in Black Ink, color them with Copic Markers: V01, V12, V15, Y11, Y13, Y15, Y17. Stamp leaves in Crushed Olve Distress Ink, die-cut and ink all edges. Create a mini box, glue sides of baskets to box. Glue leaves and flowers to left side of basket. Add Liquid pearls to flowers. Make a bow and glue it to basket. Add tissue paper to basket. Hello and a little giveaway! So what about a little giveaway?! A couple of weeks ago I dyed some seam binding ribbon and I love it!! and I want to share some of these with you. Just leave a comment here telling me which of these is your favorite color and I will send it to you, about 5 yards! Easy peasy! I will announce the winner this Friday!! Wee Memories Scrappy Saturday Challenge # 64: "Masculine"
Hello my friends, welcome to another Scrappy Saturday Challenge. This week we are having our Monthly Blog Hop, so if you have arrived here from Danielle's blog, you are in the right place, if not, I will invite to start from Jenny's blog and don't miss any wonderful project. Our challenge this week is all about "Masculine Projects". Our challenge this time is sponsored by "Graphic 45" and 1 lucky winner will win a Paper & Stamps from G45!!! Makce card base from cardstock. Cut an Ivory panel, ink all edges, stamp saying and adhere it to card. 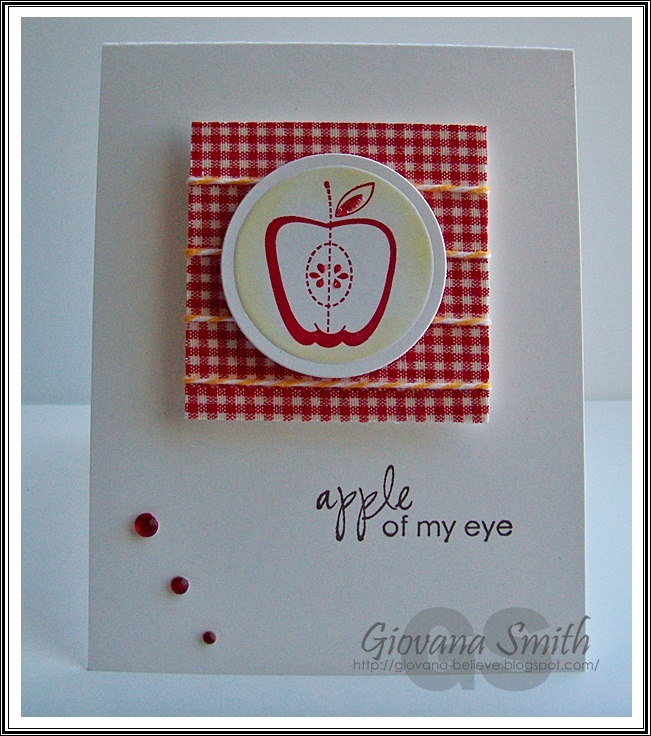 Position a square and circle die on a piece of Ocean Mist Cardstock. Create a window panel. Stamp images randomly, ink all edges and adhere it to card with foam tape. Stamp a guitar image, cut it out and adhere it to card. Embellishments: Caribbean Twine (The twinery). Accessories: Square and Circle Nestabilities (Spellbinders), Foam tape, Sponges. Now, head over to Laurel's blog and enjoy her wonderful creation. CSS Alumni Blog Hop "Sketch Time"
Welcome to another CSS Alumni Blog Hop! This time around, the hop is based on an Sketch Challenge. If you have arrived here from Deb's blog, you are in the right place, if not you should start over from StampTV. 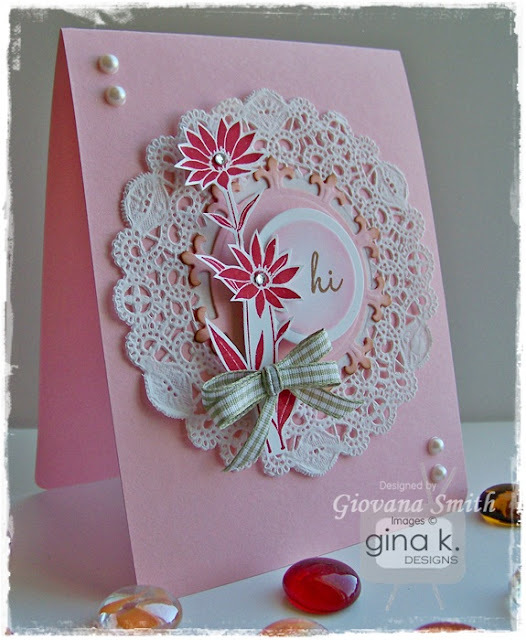 Make card base from Innocent Pink Cardstock. Cut a panel from White Cardstock and Patterned Paper, ink all edges of PP. Mat together and straight and zig-zag stitches. Stamp sentiment in Aged Mahogany Distress Ink. Tie on Seam Binding Ribbon and create a double bow. 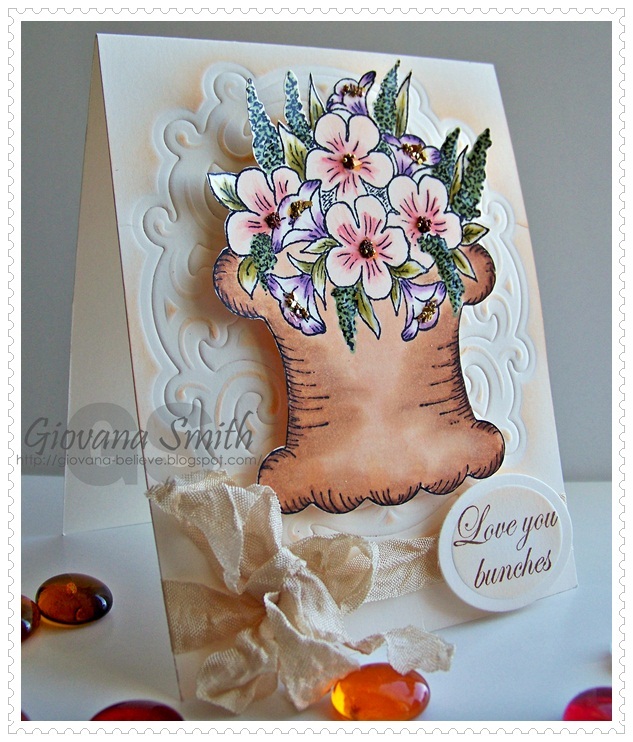 Stamp image on White Cardtsock in Worn Lipstick and add Aged Mahogany to the flower edges. Die-cut, emboss and stencil piece with Rectangle Nestabilities. Mat this piece with a bigger piece of Cranberry Tart Cardstock. Adhere to card with foam tape. Add stickles and pearls to flowers. Accessories: Rectangle Nestabilities (Spellbinders), Sewing machine, Yellow thread, Sponges, Foam Tape, Scor-tape. 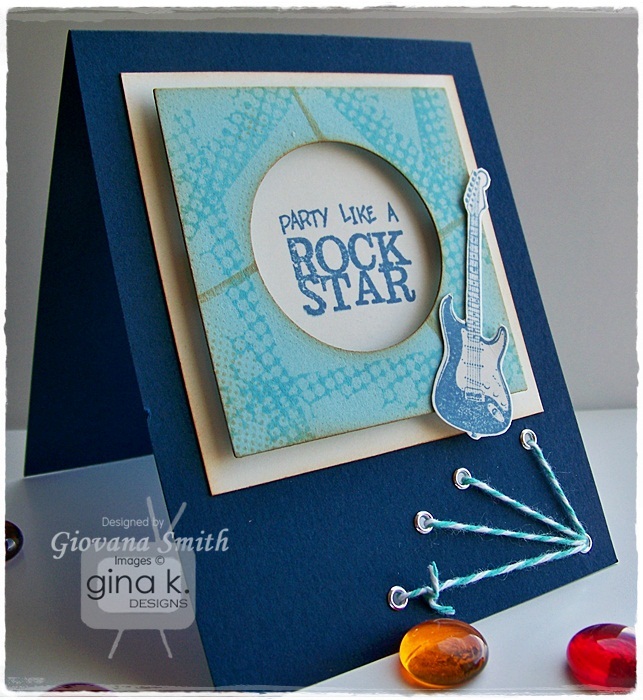 All the products in bold can be found at Gina K. Designs Store. Now head over to Jenny's blog and enjoy her awesome creation. Make sure to leave a comment as you hop along because on Tuesday morning (August 16th), we will randomly choose one of the comments from all the blogs who will get a stamp set of their choice valued up to $24.95! Heartfelt Creations Release Time!! "Decorative Basket Collection"
Hello my friends! It's Heartfelt Creations Release time!! 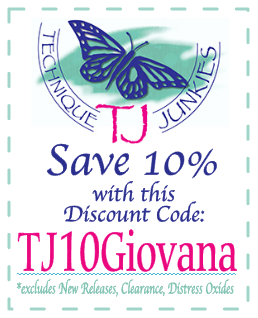 You are not going to miss the beautiful stamps and dies that are included in this collection. The Decorative Basket Collection is a definite must have for all crafters. This collection features classic basket images that will be a "go to" set time after time. You can arrange endless styles of flowers into these baskets, use them for party favors, harvest baskets, Christmas baskets...the possibilities are endless. 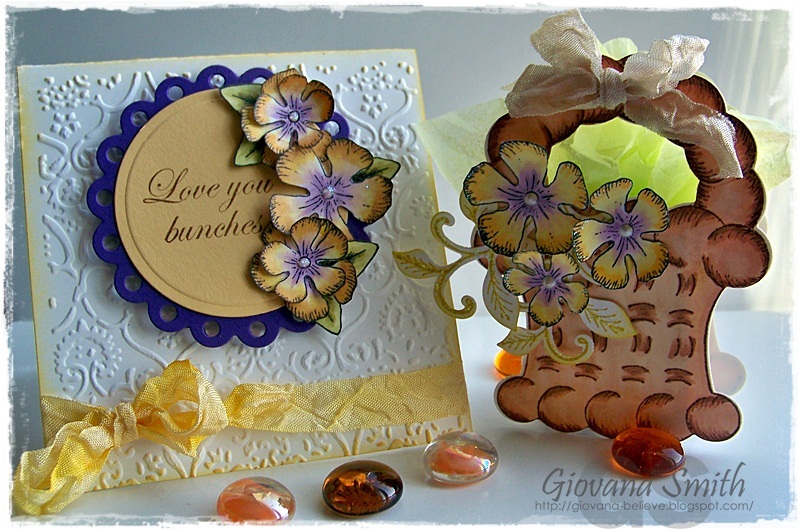 This collection features 5 new precut stamp sets and one exclusive Heartfelt Creations die manufactured by Spellbinders. HCPC 3412 Botanical Floral Basket Pre-Cut Set. HCD 710 Oval Window Die. Accessories: Foam tape, Sponges, Seam Binding Ribbon (Etsy), Copic Markers: R20, R22, V01, V12, V17, E21, E33, YR20, Y35, YR000. Emboss and stencil front of card with Oval Window Die (stencil it with Dried Marigold Ink). 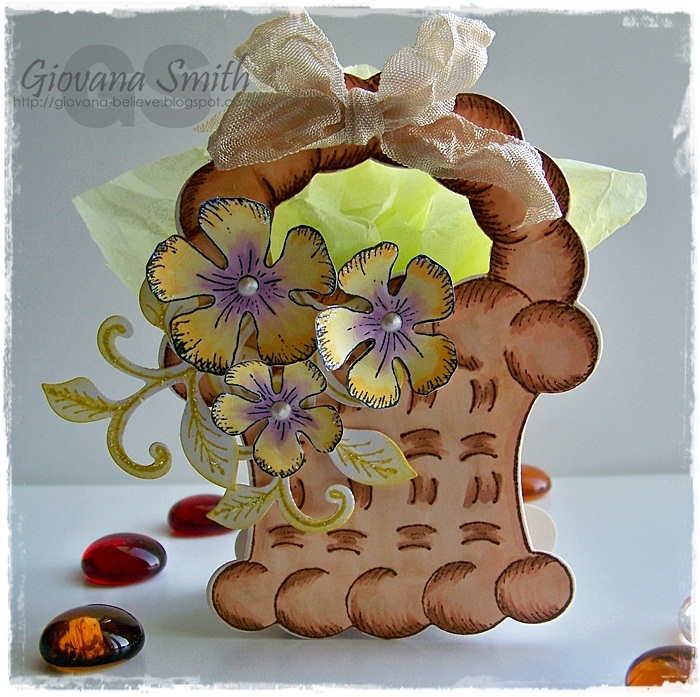 Stamp basket image from HCPC 3412 Botanical Floral Basket Pre-Cut Set on White cardstock and color with it Copic Markers. 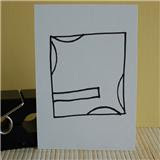 Cut out image and adhere it to card with foam tape. Add Gold and Brown Gala Glitz to flowers and Crystal Lacquer to fern leaves. 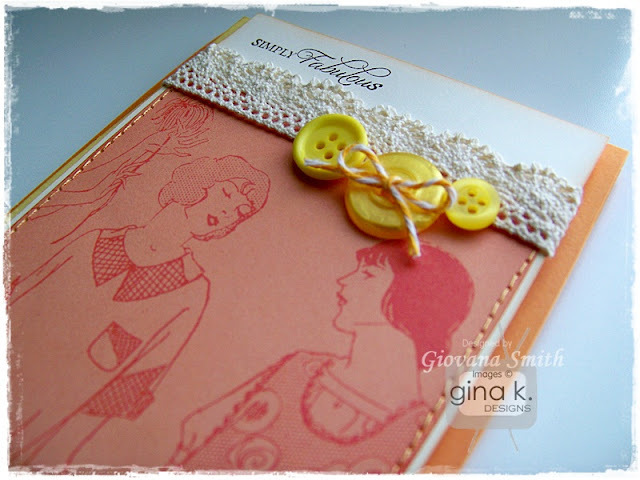 Stamp sentiment on Ivory cardstock in Vintage Photo Distress Ink. 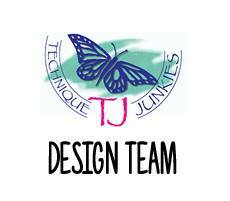 Die-cut, emboss and stencil it with Oval Nestabilities. Tie on ribbon and make a double bow. 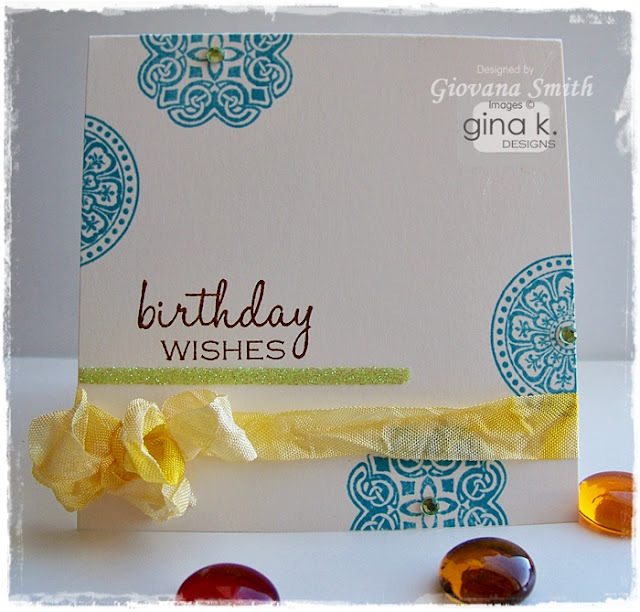 Add Sentiment to card with foam tape. HCD 714 Decorative Layered Basket Die. HCD 701 Posy Patch Die. HCPC 3414 Belated Birthday Wished Pre-Cut Set. Ink: Walnut Stain Distress, Aged Mahogany Distress, Worn Lipstick Distress, Crushed Olive Distress (Ranger Industries). Accessories: White Stain Ribbon (Offray), Flower Border Punch (Martha Stewart). Cut a piece of White Cardstock 4.25" x 11". Score it at 5" and 8.5"
Add patterned paper on each panel. Ink all the edges of patterned paper first. Die-cut baskets on Red and Chocolate Brown Cardstock. Glue them together and adhere them on front of card. Stamp waevy leave and die-cut. Adhere it to basket. Die-cut Posy Patch flowers and ink all edges. Create a flower and adhere it to front of basket. Add a green dewdrop. Punch a piece of Patterned paper, ink all edges and adhere it to inside panel. Die-cut, emboss and stencil a Label piece. Stamp sentiment and adhere it to card. Leave a comment on the Heartfelt Creations blog for a chance to win the entire release valued at $85.00. Hello my friends!! Hope you are having a great Tuesday. Today I have some time to play few challenges, something that I don't do very often anymore, but I found some good ones and I combined them all in 1 "Clean and Simple" card!! 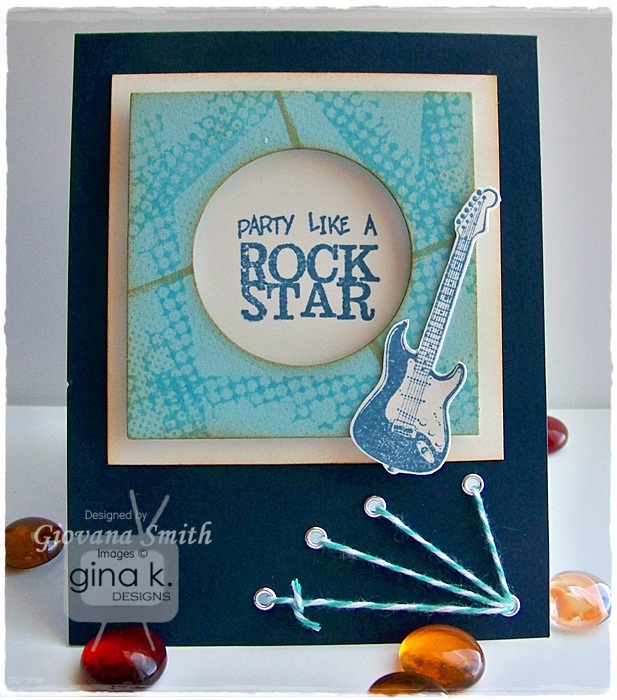 CAS-ual Fridays: Add Glitter using Glue dots or strips. Make card base from Ivory cardstock. 4.25" square. Stamp images in Broken China Distress Ink. Adhere a strip of Score-Tape (1/8"), add Limeade Glitter. Tie on ribbon and create bow. Secure the bow with a glue dot. Add Light Green Rhinestones on images. Embellishments: Limeade Glitter (Martha Stewart), Light Green Rhinestones (Kaisercrafts), Yellow Seam Binding Ribbon (handmade). Accessories: 1/8" Score-tape, Glue dots. Hello my friends! Hope you are having a great Monday. 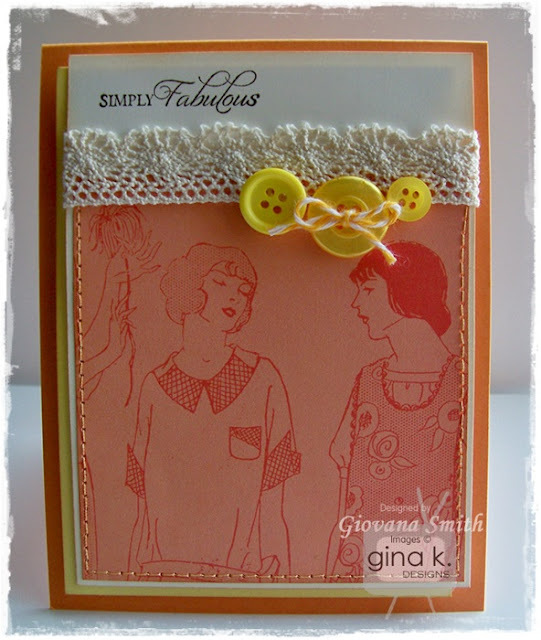 Today I am playing the CPS Challenge, love the sketch and also I am using beautiful Lace and Fabric Tape from Love my Tapes!! Cut a red and Ivory Cardstock Panel. Emboss top and bottom from Ivory panel, ink all edges and mat it with the red piece. Adhere it to card. Cut a couple of pieces of Mini Check Peppermint Fabric Ribbon (about 2.5" long) cut the outsides and adhere them to card. Create a Rossette with Beige Lace Tape. Cut a Circle piece (about 1.5" diameter) from cardstock, starting from the outside edge start folding the lace ribbon and firmly press onto the cardtsock, continue doing it until you reach the center. Add a big gold brad and your rossette is ready!! Add scor-tape and adhere it to card. 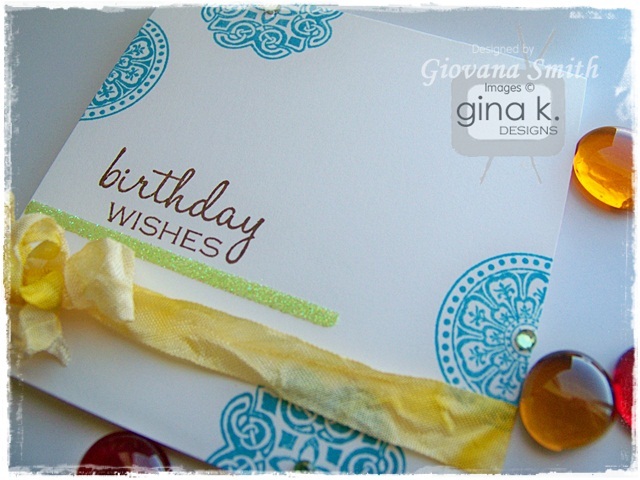 Stamp sentiment and add Start Dust Stickles. Accessories: Organic Flourish Embossing folder (Provo craft), Scor-tape), Sponges. 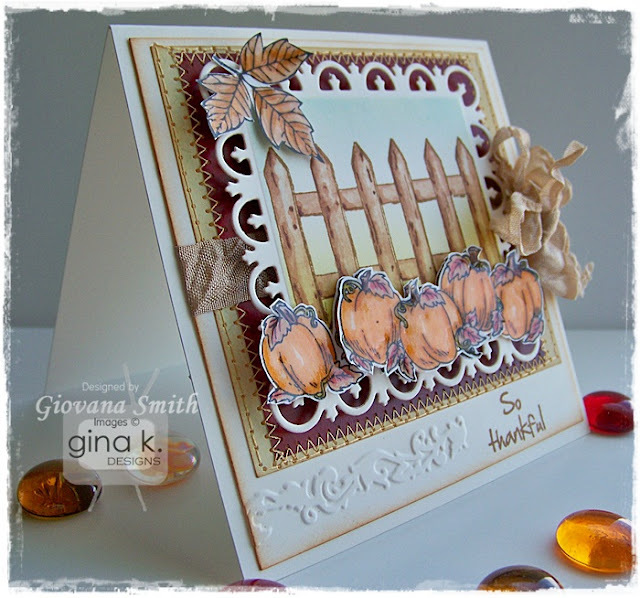 Gina K. Designs Inspiration Blog Hop Day 3: "Gnome One Like You" and Various Verses"
Hello my friends, hope you are enjoying our August Inspiration Blog Hops. 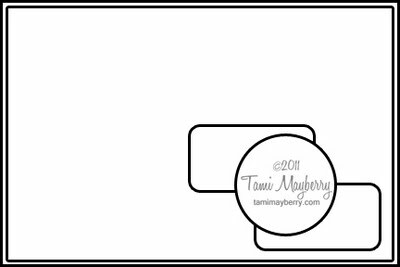 Today is our last day of hops and we are featuring "Gnome One Like You" illustrated by Tami Mayberry and the Free with Three "Various Verses" by Gina K. Designs. Cut a panel from Innocent Pink CS, punch out right side. 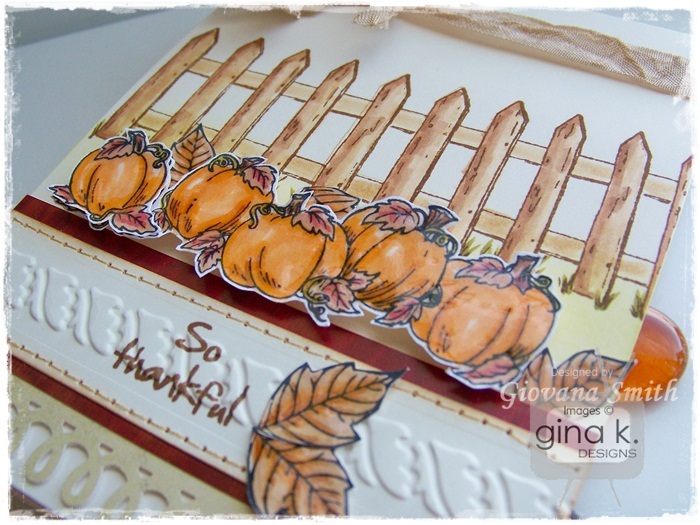 Cut patterned paper strips, ink all edges and adhere them to previous panel. Add stitches. Adhere panel to card. Stamp image onto White cardstock in Black Ink. Color it with Copic Markers. Die-cut, emboss and stencil image with Square Nestabilities. Adhere it to card. Stamp banner and sentiment, cut it out and adhere it to card. Embellishments: Ligth Green Mix Jar Buttons (Gina K. Designs), Maraschino Twine (The Twinery), Pink Paper flowers (Prima), White Opal Liquid Pearls. Accessories: Lace Border Punch (Martha Stewart), Scor-tape, Pop Dots (Plaid), Glue Dots, Sewing machine, Sponges, Copic Markers. Free with Three "Various Verses"
Hi Card: Love this simple and yet elegant, super easy to make, and look, no sewing, no coloring!! 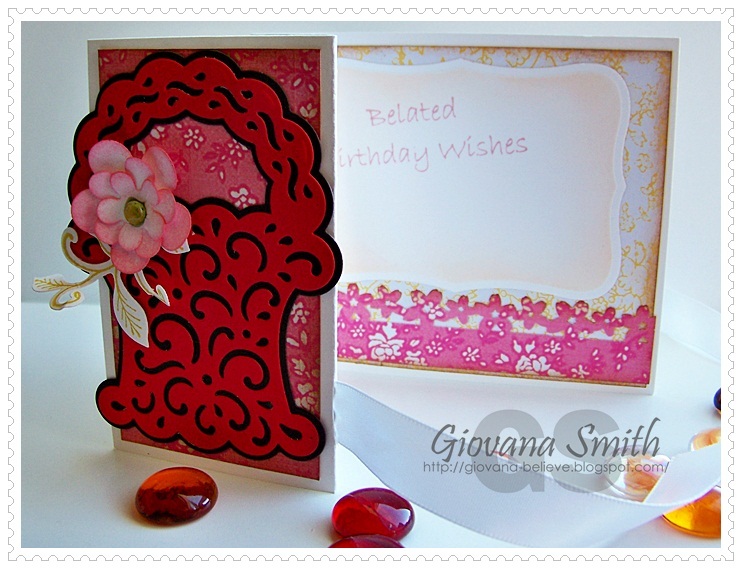 Make card base from Innocent Pink CS. A2 size. Punch bottom corners. 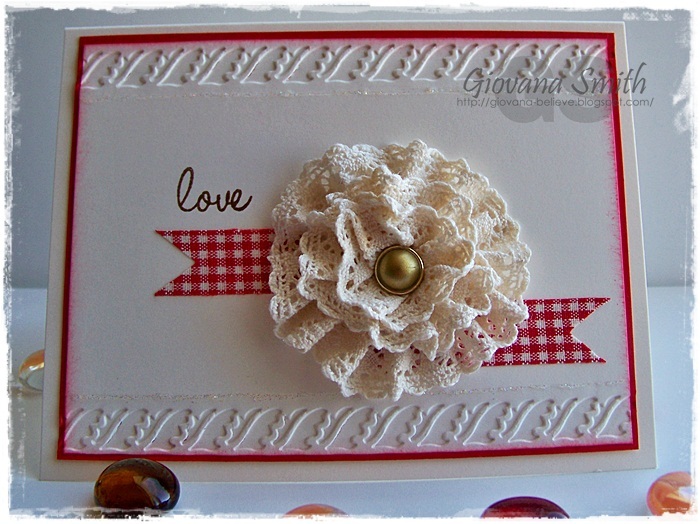 Adhere Doily to card base. 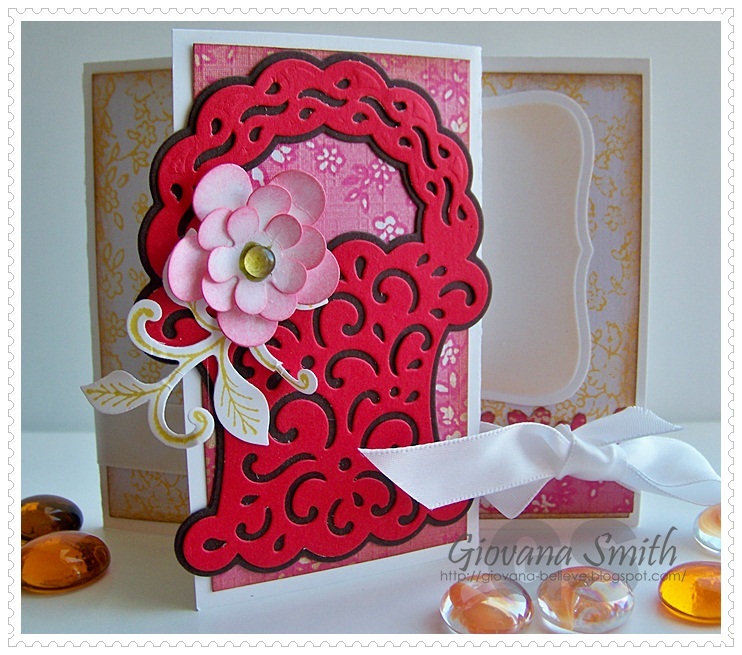 Die-cut, emboss and stencil a piece of Innocent Pink CS using Fleur de Lis Motifs Shapeabilities. Adhere it to card. 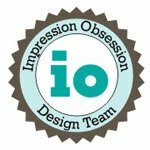 Stamp sentiment, die-cut, emboss and stencil it with Circle Nestabilities. Adhere it to card with Pop dots. Stamp flower image on White CS in Red Ink. Cut it out and adhere it card with Pop Dots. 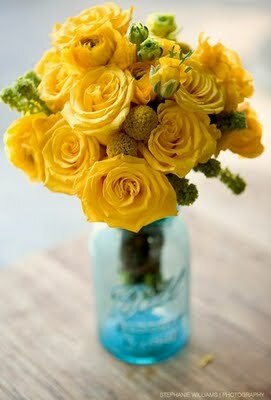 Add Clear Rhinestones to flowers. Make a double bow using Bow-Easy. Add pearls in opposite corners. Ink: Vintage Photo, Worn Lipstick (Ranger Industries), Real Red (Stampin' Up). All the items in bold can be found at Gina K. Designs store. Are you ready for more inspiration? Visit the blogs listed below and also don't forget to leave a comment for your chance to win!! Gina K. Designs August Inspiration Blog Hop Day 2: "Basket Buddies" and " Heartfelt"
Hello my friends and welcome to Day 2 of Gina K. Designs August Inspiration Blog Hop. Today we are featuring 2 stamps sets "Basket Buddies" illustrated by Melanie Muenchinger and "Heartfelt" illustrated by Theresa Momber. 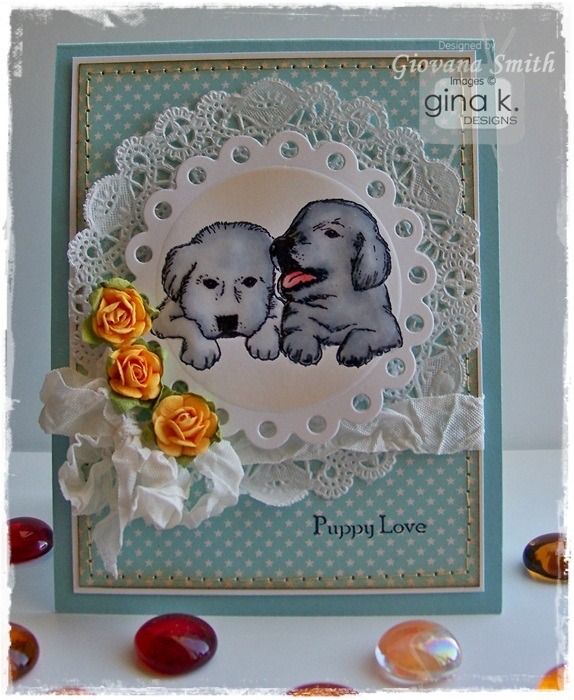 Puppy Love Card: I think this image is more than adorable! It reminds me the puppy I got to my niece when she was 6 years old (now she is 21!!) The puppy was a Cocker Spaniel and we named her "Pelusa" (that means fuzz). She was a good company for the family, sadly she passed away last year. Anyway, the darker puppy looks so much like her. 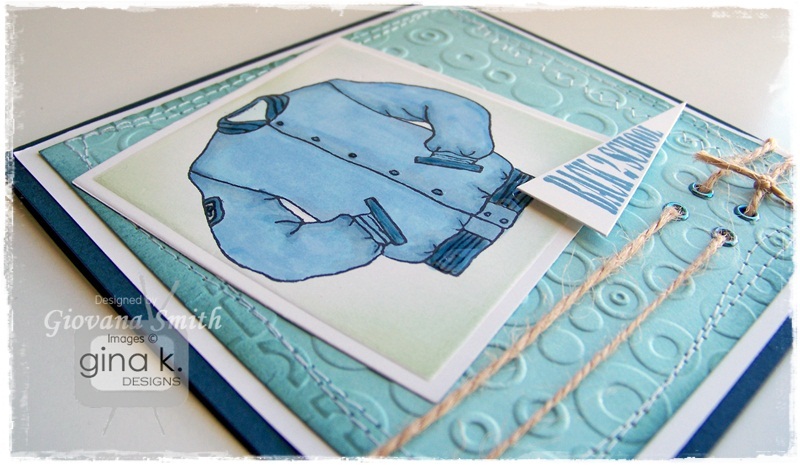 Make card base from Ocean Mist cardstock. A2 size. Cut a panel from White cardstock, mat it with patterned paper (ink all edges) and add stitches. Adhere doily to cardstock panel. Tie on ribbon and create a double bow. Adhere panel to card. Stamp image on White cardtsock, color it with Copic Markers. Die-cut, emboss and stencil image with Eyelet Circle Nestabilities. Adhere it to card with Pop dots. Add Crystal lacquer on puppies, set aside to dry. Ink: Memento Tuxedo Black (Tsukineko), Vinatge Photo (Ranger Industries). 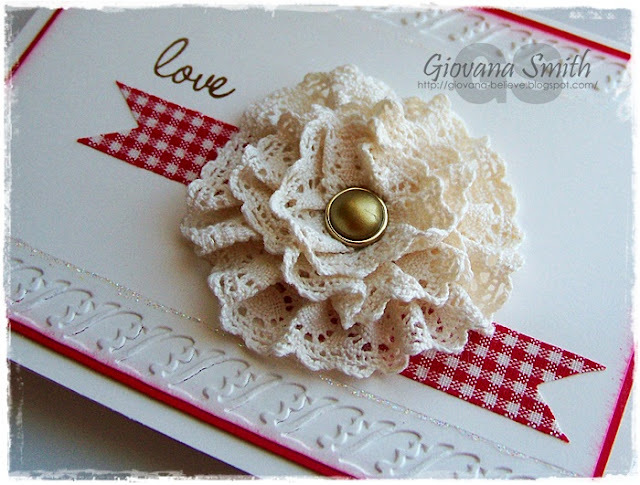 Embellishments: White Seam Binding Ribbon (etsy), Paper flowers (Recollections), Doily. Accessories: Eyelet Circle Nestabilities (Spellbinders), Sewing machine, Pop Dots (Plaid), Scor-tape, Glue dots. 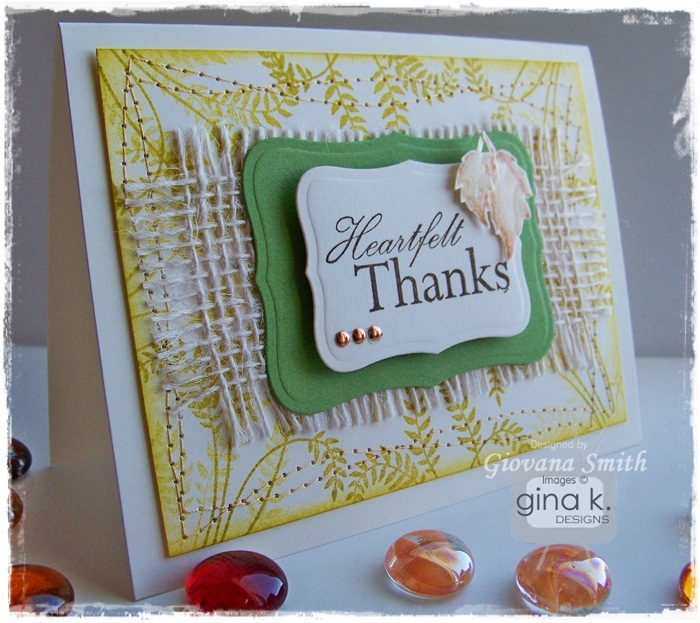 Heartfelt Thanks Card: Love this set! 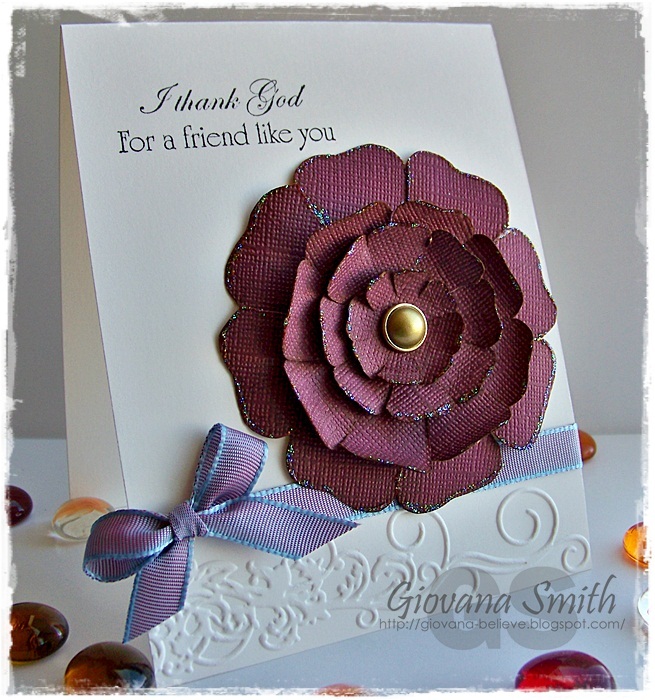 Perfect for Thanks - Thanksgiving cards or a mix match with any other Theresa's illustrations. My card is pretty simple, but I love the results. Make card base from Ivory Cardtsock. A2 size. Cut a panel from Ivory Cardstock, ink all edges and stamp leafy image all around. Add straight stitches in a funky way. Adhere a piece of Cream Burlap fabric. Die-cut and emboss a piece of Grass Green and Ivory Cardstock. 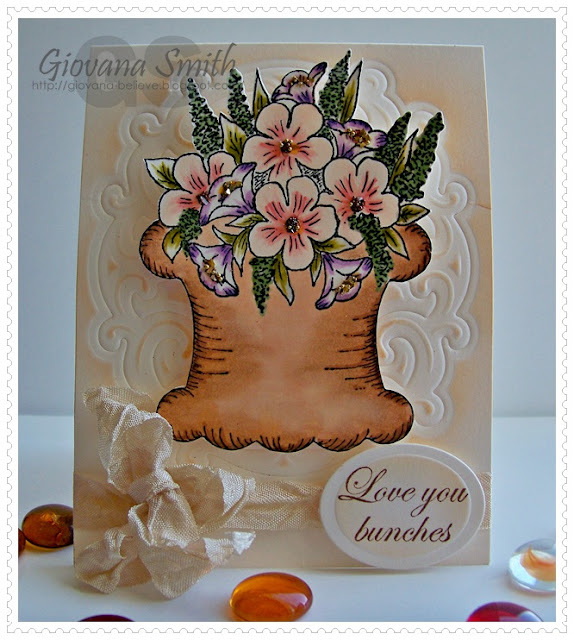 Stamp sentiment on Ivory cardstock. Mat together and adhere them to card with Pop Dots. 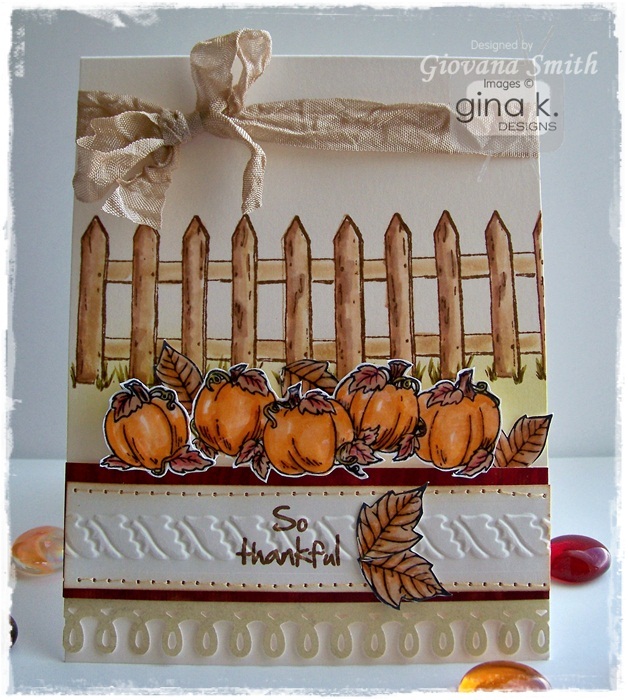 Stamp leaves, cut them out and adhere them to card. Accessories: Label 8 Nestabilities, Grand Calibur (Spellbinders), Pop Dots (Plaid), Sponges, Sewing Machine.